I’m a serial- sitter. I sit and read nutrition research for hours. If I’m not sitting and reading, I am sitting and writing or sitting on an airplane. All that inactivity is a career hazard, so I make sure I exercise five days a week. I thought I was doing just fine until I read some research that knocked me out of my chair. All that sitting is lethal, so says Dr. James Levine, a researcher at the Mayo Clinic. He says that being sedentary increases your risk of Type 2 diabetes and high cholesterol. Oh yeah. It’s also making you fat. Inactivity causes a decline in electrical activity in your muscles. This reduces insulin’s effectiveness. When insulin isn’t doing its job, your Type 2 diabetes-risk goes up. The enzymes responsible for breaking down fats take a plunge, causing your good cholesterol levels to fall, too. Sitting uses only one calorie a minute. 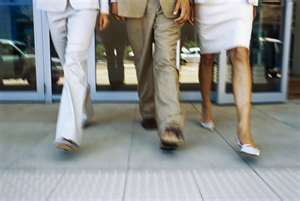 Moving around (doing ANYTHING) burns calories at three times that rate. I drink more water. A full bladder is a gentle reminder it’s time to get up and move. I avoid eating lunch at my desk. If that’s inescapable, I get up and walk as soon as I can. I make a lot of calls standing up. The person on the other end can’t hear me pacing and stretching.